Celebrate the Fourth of July with this fruit parfait recipe. It’s time to celebrate the Fourth of July. As you get ready to celebrate with friends and family, get ready with the perfect snack. Make these patriotic desserts to impress all your guests. Check out this easy fruit parfait recipe so that you can deck out your table in red, white, and blue. Here’s what you’ll need to get started. Start by mixing the yogurt. Combine the yogurt with the lemon zest and the vanilla. Stir until smooth. Once the yogurt has been mixed, it’s time to assemble the parfaits. 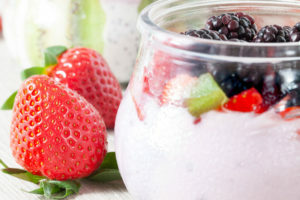 Using the mason jars, layer the fruit and the yogurt, alternating between each layer. Star with the strawberries, the yogurt then the blueberries. Continue until the jar is about three quarters full. Then garnish the top of the jar with more berries, a sprig of mint, and lemon zest. Refrigerate until ready to serve. Enjoy this quick, easy, and healthy recipe for all your Fourth of July festivities. It’s the perfect, healthy way to celebrate with all your loved ones. Have a Happy Fourth of July! Ensure that you put safety first and invest in the right insurance coverage. Contact the professionals at Robert J. Los Insurance Agency to find you the right insurance plan. Located in Hamburg, New York, we serve all your personal and commercial insurance needs.